OK, maybe you already knew you needed her. Maybe you already had her! Maybe it’s just me then! WHATEVER. Now you’re all getting her here, so enjoy! 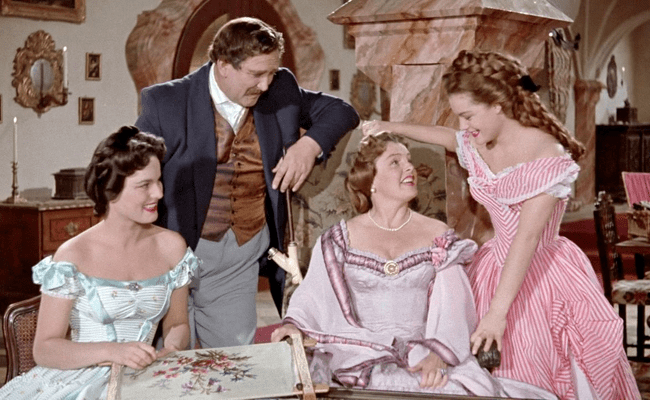 Thanks to Turner Movie Classics, I finally had a good sit-down with alllllll three of the classic Sissi movies, Sissi (1955), Sissi: The Young Empress (1956) (aka Sissi – Die junge Kaiserin), and Sissi: The Fateful Years of an Empress (1957), (aka Sissi – Schicksalsjahre einer Kaiserin), plus the movie that wraps up and condenses the three full German-language films into one English-dubbed movie, Forever My Love (1962). It’s a romp through the Austro-Hungarian Empire of old, with enough hoopskirts, big hair, sweeping vistas, and unrelenting romance to fulfill anyone’s young-girlish fantasies. Being young or girlish not required, everyone can play along! Let me start by admitting I didn’t know a ton about Empress Elisabeth “Sissi” of Austria other than what Wikipedia told me and what I gleaned from a tour of the Schönbrunn Palace in Vienna about 10 years ago, where her rooms and artifacts are key to the tourist trade. Sissi of legend is the ultimate pretty pretty princess, and this trio of films doesn’t disabuse us of that notion. 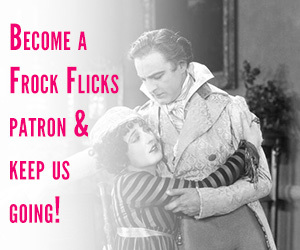 Heck, these movies helped build up her legendary princess status! They were played on TV around Christmas in German-speaking countries for years (anyone know if they still are?). Historically speaking, Elisabeth Amalie Eugenie was born in 1837, the daughter of a Bavarian duke, raised in the country, far from court life in Vienna. 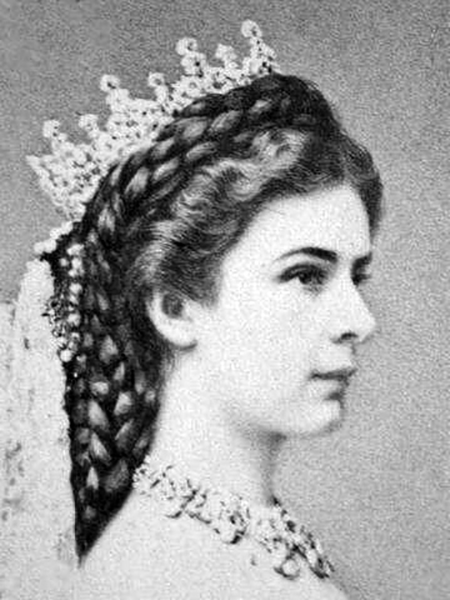 Her mother, however, was sister to Archduchess Sophie, who decided a cousin would be a good match for her son, the ruling Emperor Franz Joseph. In 1853, Sissi accompanied her mother to present her older sister, Helene, as a future bride for the emperor. And that’s when fate stepped in. 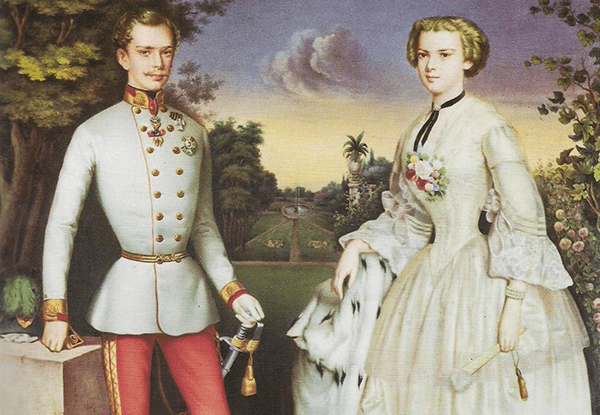 Various stories have sprung up about how it happened, but essentially Franz Joseph fell madly in love with Sissi, told his mother he had to marry the younger sister, and that was it. 1854 – Miniature of Franz Joseph and Sissi. Via Wikimedia Commons. Franz Joseph married Elisabeth in 1854, and in quick succession they had a daughter, Sophie, in 1855 (who died after two years) and another, Gisela, was born in 1856. Sissi became pregnant again, and in 1858 their son Rudolph was born. 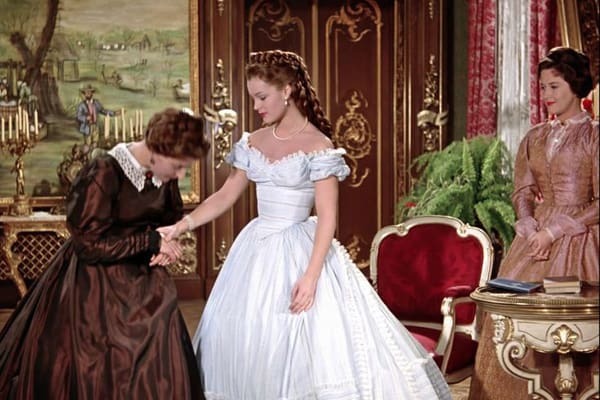 This took a toll on Sissi’s already delicate health, possibly exacerbated by the stressful situation of adjusting to strict court formalities and dealing with her overbearing mother-in-law. 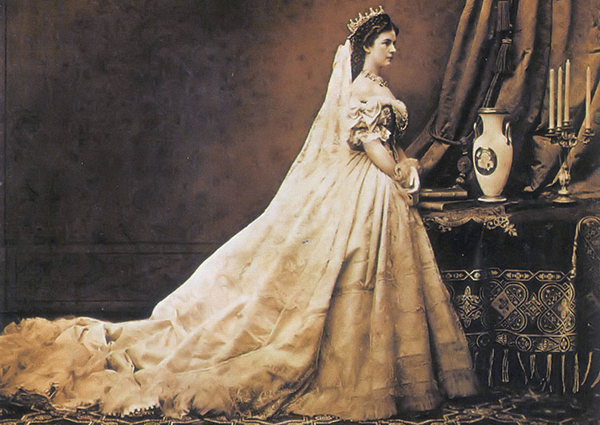 1867 – Sissi’s coronation as Queen of Hungary. Via Wikimedia Commons. The person of Sissi has been described as an introvert, a free spirit, independent, controlling, obsessive, romantic, melancholy, having low self-esteem, dreamy, shy, awkward, proud, nervous, and paranoid. Her beauty and fitness routines have become the stuff of legend, noting how she rigorously controlled what she ate and how much she exercised, rode horses, hunted, even took up fencing, and maintained a 19″ waist all her life. Her famously long hair — hanging down to her feet — required its own fanatical routines with daily upkeep by a special hairdresser and needed concoctions of egg and brandy to keep it looking fabulous, yet the weight of all that hair gave her constant headaches. Sissi has been compared to the 20th-century’s Princess Diana for being the people’s princess with a tragic side. How much of this is true and how much is myth is hard to say, but these 1950s movies sure did seal the deal. 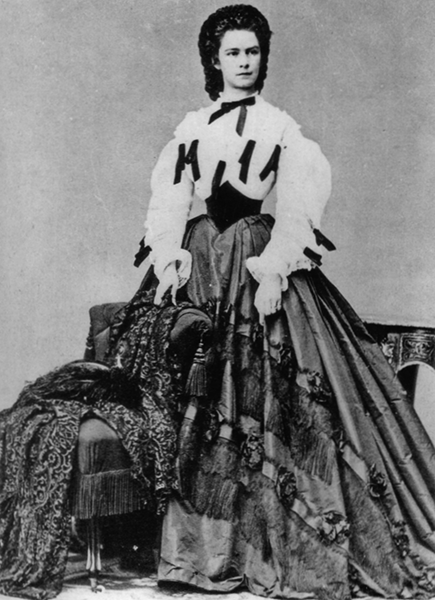 1862 – An everyday look for the empress. Via Wikimedia Commons. But hey, we don’t want to get all bogged down with historical seriousness — we’re here for the pretty pretty princess! And that’s why these movies deliver. They don’t delve into her complicated familial relationships or Sissi’s obsessive daily regimens and what that meant about her or society at the time. These frock flicks don’t even cover the entirety of life’s events and all the changes in the Austro-Hungarian Empire of the time. 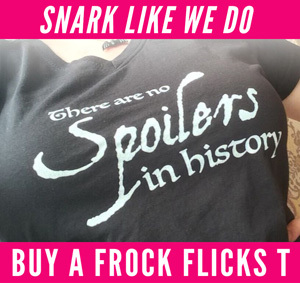 Heck no, it’s a frothy fancy frock flick for fun, yay! 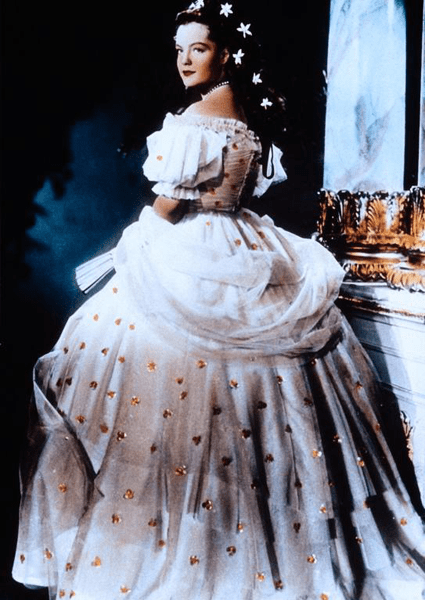 1865 – Check out Sissi’s hair. Via WIkimedia Commons. 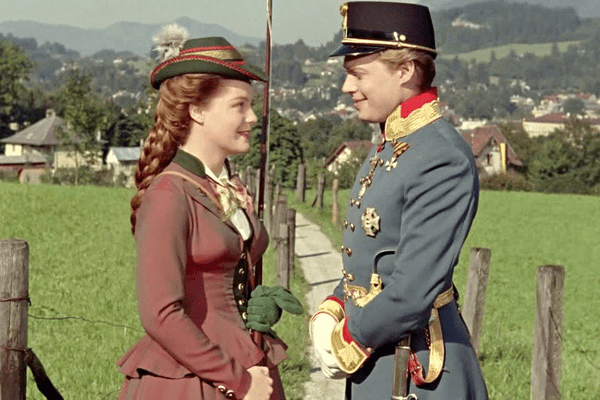 The first movie takes a whole 102 minutes just to introduce 16-year-old Sissi to Emperor Franz Joseph and get them married. Sissi and Franz meet cute. She wows him with her mad zither skills. 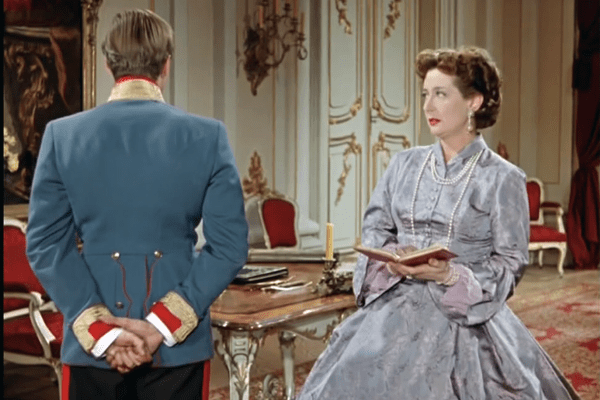 Franz’s mom complains because she wants her son to marry Sissi’s older sister. But Emperor Franz gets his way, and nobody’s happy about it. 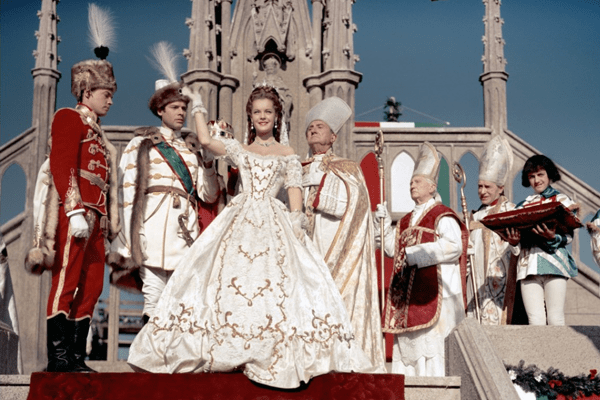 The second film (109 minutes) has a few more plot points, looking at Sissi’s conflicts with her husband and mother-in-law, Franz and Sissi’s first child being born and being taken away by said mother-in-law, plus Sissi’s support for Hungarian Count Gyula Andrássy, ending with Franz and her being crowned King and Queen of Hungary (which happened in 1867). 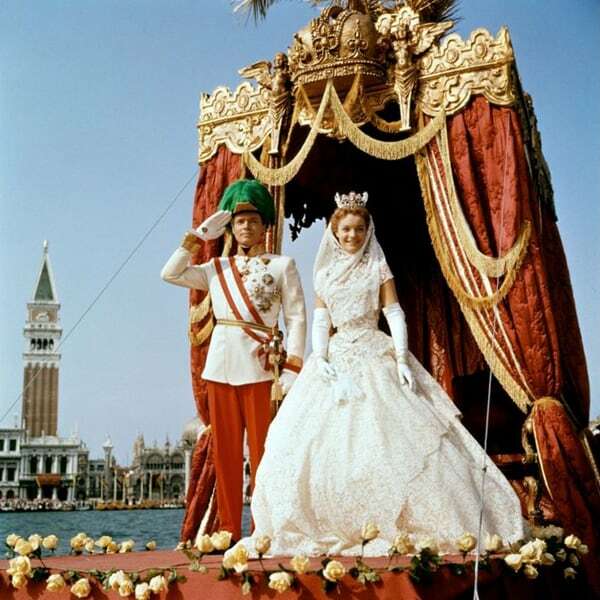 But really, it’s all about the Hungarian coronation. The final film (clocking in at 107 minutes) picks up in Hungary with Sissi rebuffing Count Andrássy’s protestations of love, and then the flick follows Sissi through a deathly lung illness and recovery in Portugal and Greece (though these locations are not clearly IDed), and she’s finally reunited in Venice with Franz Joseph and her daughter (who should have died, plus there’s no mention of her other daughter or son). But who wouldn’t get better in time for a trip to Venice? Chronologically, these three movies would cover about 15 years of her life, but judging by the film’s events, I’m guessing about four or five years are supposed to pass. Forever My Love smushes it all down into 147 minutes with terrible English dubbing for American audiences — though admittedly, I didn’t miss a whole lot of what was cut out. 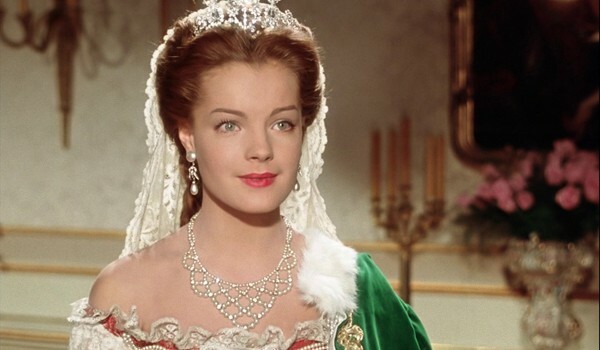 It should be noted that actress Romy Schneider, who starred as Sissi, came to loathe these movies. The director had planned a fourth one, but Schneider refused. 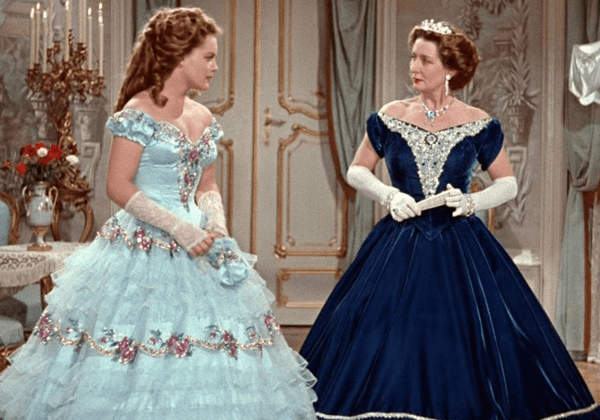 She didn’t want to be typecast as the sweet, naive little girl anymore, reportedly saying, “Sissi sticks to me like oatmeal.” Eventually, Schneider left Germany for the French cinema and also Hollywood. What really sells these movies is the fluffy, fancy costumes, which were designed by a woman known as Gerdago, sometimes called the “Austrian Edith Head.” Gerda Iro was a fine artist, and many of her Art Deco statuettes still show up for auction. In the 1920s, she began designing film costumes, and after World War II, she worked on dozens of Austrian movies, specializing in historical costumes. Sticking with a short time period means the costumes don’t need to change much, it’s basically 1850s-1860s for all three films. Hoopskirts reign supreme, even if they sometimes get a bit of a New Look 1950s style (ironic since that 20th-century fashion is a reinterpretation of the 19th-century original). This is one of the most egregiously modern dresses. Couple things I have to complain about. One is the rampant ridgeline apparent in so many of the gowns. 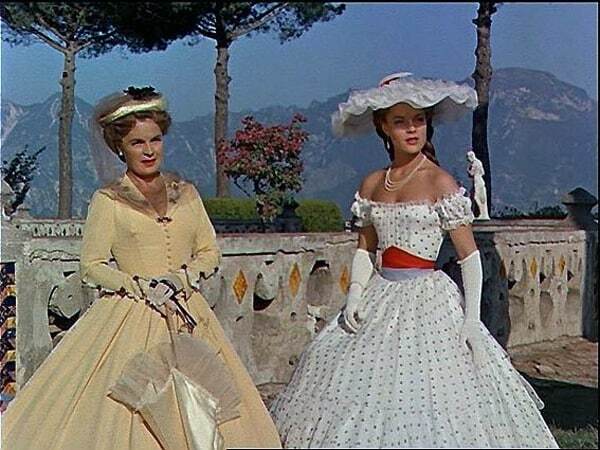 However, it’s more obvious in the extras and secondary characters than Sissi’s gowns because I think less fabric or lighter-weight fabric was used on their costumes. You can see a line where the hoop wire shows through the dress because the dress fabric is thin and there isn’t a petticoat between the hoop and the gown (the GBACG has a great little article about this on Facebook called “The Lamp Shade Effect“). You don’t see this in the period because women just wore petticoats over their crinolines. Also, historical crinolines usually had a lot more consecutive rings (say 15-20) than modern hoops (which tend to have 2-5). Fewer hoop rings are more likely to poke through than the smoother line of multiple rings. 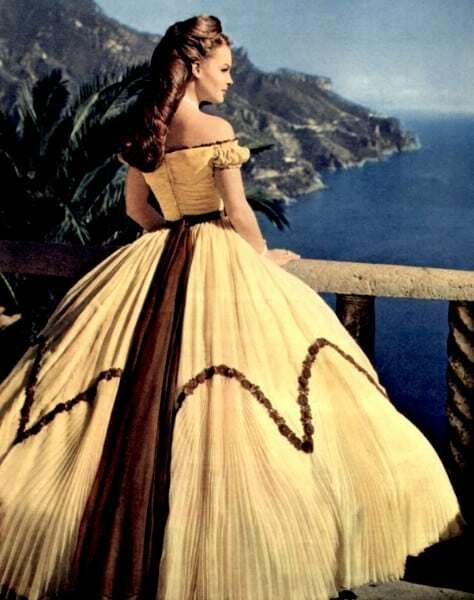 Only a hint of ridgeline is visible at the bottom of Sissi’s gown. While we’re on the subject of foundation garments, no corsets are in evidence. The dresses are fitted closely in a period-esque style, but the breast shape has a very “cross your heart” bra look. It’s not terrible, but it’s not 1860s corsets either. 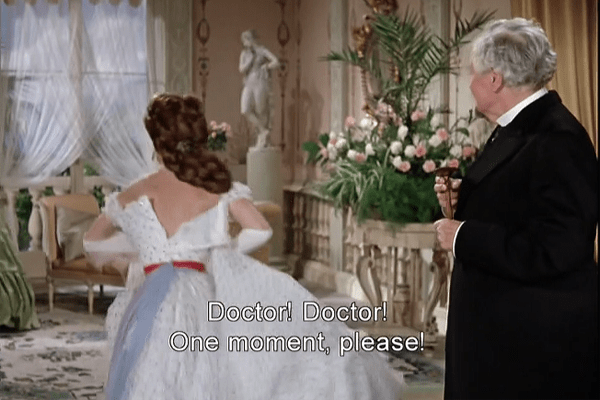 Tellingly, a scene in the third movie has a doctor examine Sissi with the back of her gown unfastened, and no corset is to be seen. I can see boning in the front of the gown, but that’s all. Archduchess Sophie could use some bust support. Not digging on Sissi’s hat. But you can just see how the front of her dress is boned. Because there’s nothing holding it up underneath. My last general nitpick is that the ladies wear a whole lot of wide, low necklines and short sleeves for daytime. Basically, what looks like ballgown bodices for strolling out in the gardens. Pretty, yes! Realistic for the period, no! The trope seems to be that long sleeves are for traveling or old ladies. 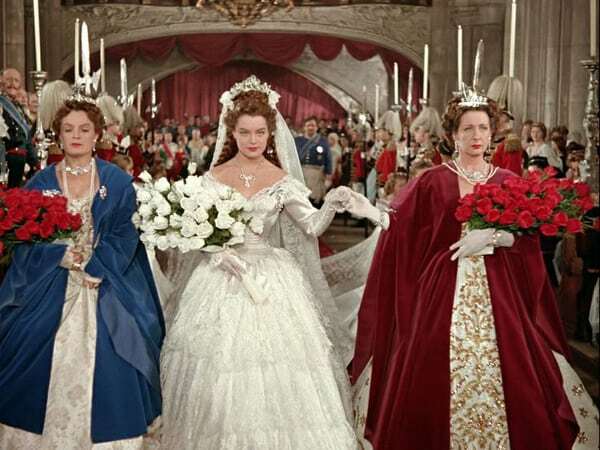 Hanging out at home, Sissi and her sister (far left) get ballgown bodices, while mom (center) has an oddly low neckline with long floppy sleeves. IDK why. I guess long sleeves are only for ladies-in-waiting, not the empress. Mom has sleeves, even though Sissi is supposed to be recovering from her life-threatening illness here. 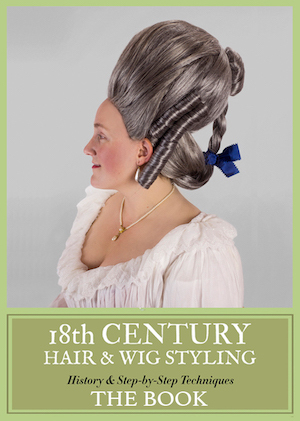 Then there’s the hair, oh my, they nailed Sissi’s crowning glory alright! Giant, massive chestnut braids piled high and mighty. This is the one thing that’s best recreated from her portraits and photos. Hairdressing scenes are important, as you’d expect. The famous Winterhalter hairstyle with the stars is used a lot. Because it’s awesome. Even her “casual” hairstyles are magnificent. OK, any critiques aside, this is SO MUCH FUN to watch! You know why? Because it’s pure, unadulterated, old-fashioned pretty pretty princess time! 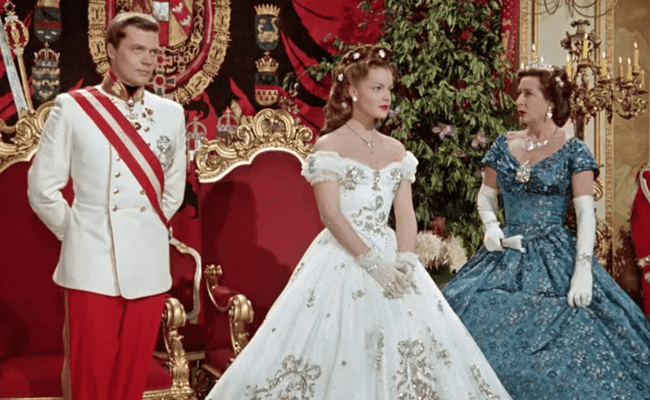 And, in a way, it’s not all about the romance — sure, Sissi is a “romantic” figure, but she’s reluctant about marrying the emperor and she’s not super thrilled about being his wife or with him or even with any other man. She has moments where she’s happy playing hausfrau, but mostly she wants to independent and left alone to do her own thing — riding horses, fishing, climbing mountains, talking to her animals, playing the zither. She’s a pretty princess with crazy long hair, but she’s a tomboy too. She spends more time away from court life, traveling, and trying to be her own person. Which is, of course, the source of conflict in the films, but it makes her a more interesting character. You can just barely see these suspender-like straps holding up the skirts on Sissi’s hiking skirt — very cool! 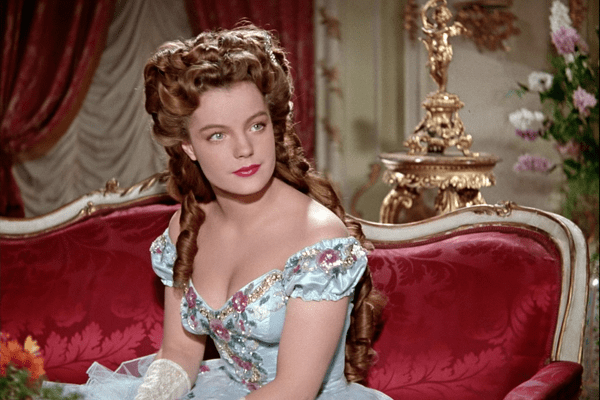 This image of Sissi may or may not be historically accurate, but she’s entertaining and as played by Romy Schneider, she’s captivating. A little bit “woe is me” spoiled rich girl at times, but also down-with-the-people, ‘I just want to drink beer and talk to my parrots’ wacky Bavarian kid too. She’s complicated, and I like that. Combined with the fabulously OTT 1950s-does-1860s costuming, it’s a great way to pass an afternoon. 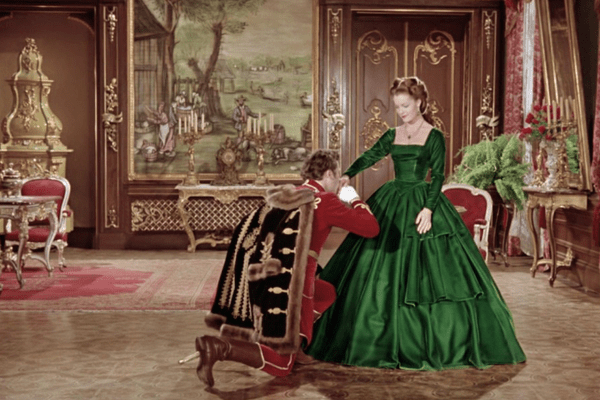 A key moment in the second film is when the imperial couple hosts a Hungarian reception and are dressed in this approximation of Hungarian royal garb. This leads to their coronation. 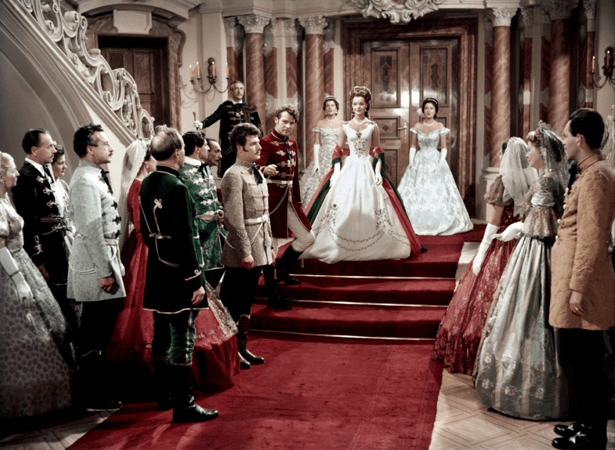 In the third film, Sissi makes peace with Hungarian rebels at Count Andrássy’s palace. She wears an embroidered gown with the Hungarian flag’s colors in her shawl. Have you watched the Sissi movies? What did you think? I have and they’re fun. But the 1950s does 1850-1860 were an argh moments due to the no corsets being worn and the lack of proper foundation garments. 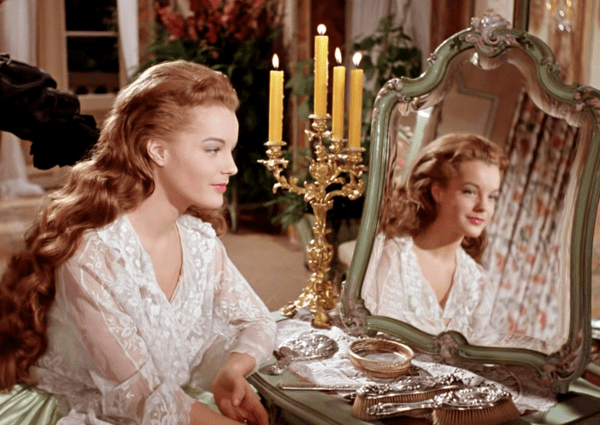 Romy Schneider rocked the hair. I prefer her cameo as Zizi in Visconti’s Ludwig. Costumes were awesome either Piero Tosi or Danilo Donati and the Tirelli Costume collect. completely agree with you! 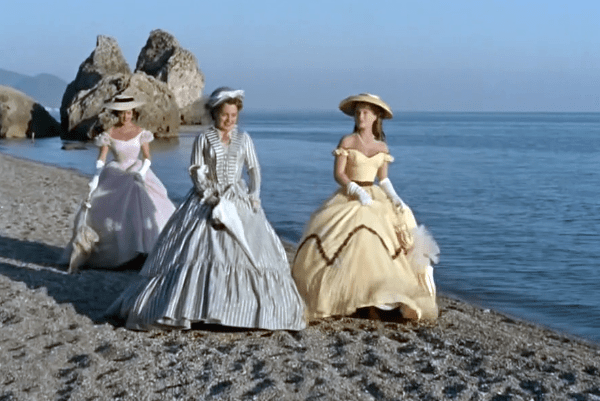 only 2 or 3 dresses looked like they escaped that “1950s-does-mid-1800s” look – ugh. Oooooh, going on my list! The flowers in her hair in the last picture makes me think of Emmy Rossum’s hair as Christine in the Phantom of the Opera movie. 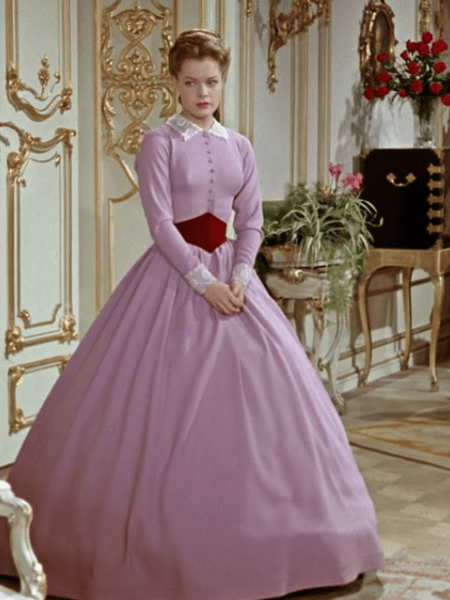 Christine’s look in “think of me” was 100 % inspired by Sissi, and so were the others. It makes sense she would be an inspiration since the movie is set in the 1870’s , although the fashion is mostly picking from her 1860’s attires, with few bustles here and there, mostly on extras. 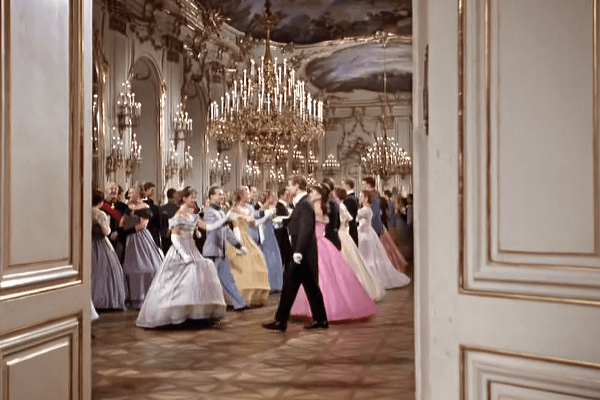 They are, apparently, the German equivalent of an annual showing of, say, “Gone with the Wind” – our friends in Germany recommended that I see them … and did when they aired on TCM. But watching them all in a row … I tired of it by the middle of the third movie. However, ages, ago, in “Costumes from the Austria-Hungarian Empire” at the Met, there were several, if I recall correctly (it was ages ago) some of the Empresses’ dresses, including her tiny, very corseted waist. There was no real catalog, per so, but a book edited by Jackie Kennedy Onassis, with some pretty pictures and a bit of a historical overview. I have it, somewhere …. I am from Slovakia (which is not that far from Austria and used to be part of Austria-Hungary, so Sissi is also kinda “ours” as well) and 100% can confirm that Sissi reruns are a pretty common thing in our TV channels, especially on hollidays. I saw the first of the Sissi films and now I’m kicking myself for not recording the other two. It is definitely a guilty pleasure and reminded me quite a bit of the Sound of Music. Probably because of the setting. Oh yes, the settings are very Sound of Music! What I itch to see is one of the musicals based on Sissi, “Elisabeth.” They have a strong gothic flavor, plus there’s an edition by Takarazuka. Whoah! I came here to mention the musical, Elisabeth!! I have seen bits and pieces of a Korean production that my daughters recorded off tv in Korea. I searched high and low for a DVD or a download, but no luck. Looked fascinating. Apparently Shekar Kepur (who directed Elizabeth & Elizabeth: the Golden Age) is making a movie based on the Elisabeth musical. Oh my God I would be SO excited for a musical. I saw it live when I lived in Japan, starring a former Takarasienne and Mate Kameras, who played Death in the Vienna version that was filmed. This was my review of it at the time; I am sure a lot of the YouTube links are broken now. The „Sissi“ movies are still hugely popular here in Germany, especially around Christmas. They are like everybody‘s guilty pleasure and even though people won‘t openly admit liking them, there was a huge public outcry a year or two ago when the movies weren‘t played during the holidays, lol. It’s liking watching Tatort on Sundays. It is what you do. Or eating really tacky chocolates, the kind with gooey cherry filling. I quite like Romy, but Ava Gardner was a better mature Elisabeth, even with all that 1970s anachronistic eye make-up, in “Mayerling,” although the film itself is ridiculous. 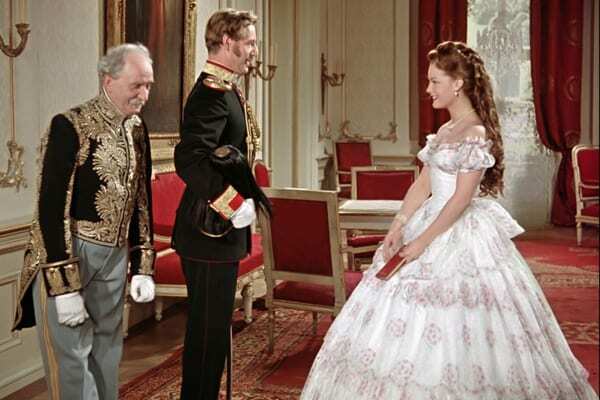 I watched the first Sissi movie when I was feeling sad and depressed (the elections, you know), and it was wonderfully diverting. I love having certain movies only shown on TV at certain times of the year! Sure, you can buy a tape or DVD, but there’s a charm to knowing that thousands of ppl are all watching the same thing together. We’ve lost that in this age of media fragmentation & on-demand streaming movies. Same in The Netherlands. Love 💕 it. It is a Christmas tradition, although I like the more recent mini series better. Yes, they’re still popular in France and Belgium around Christmas, and watching them is my guilty pleasure as well ;) ! I remember re-watching some bits a little while back, and noticing the low necklines for the first time. Proof of having learnt at least a little over the last couple of years. And yes, they’re still shown every year around Christmas, even in the Netherlands ;). You’re a braver woman than I! I tried to watch the first movie and it was so saccharine that I gave up. Definite eye candy tho! You can’t fight the fluff!!! Few days ago i was just reading a biography on Sissi and now you just post a review of the movies of her! What a coincidence! In my opinion, the clothing much one of, if not, the redeeming quality out of the contents in the movie, even if it ‘s not accurate. The dresses are just damn gorgeous and that hairstyles! I WANT IT! Regarding the story, the movies is not entirely at fault on romanticizing Sissi’s life. A lot of people before the 80s loved to portray Sissi as some classic fairy tale princess and didn’t know how miserable her life truly was. I admit i actually cried reading Sissi’s life. She’s much a Disney princess meets real life. So i’m hoping there will be a film or mini series that accurately depicted her (that is, with of course, some accurate beautiful costumes :). The green dress in the second movie is my dream dress!!!!! Hands down!!! I used to watch these with my mom every year and since she passed, I still watch them as a tradition!!! My faves!!! 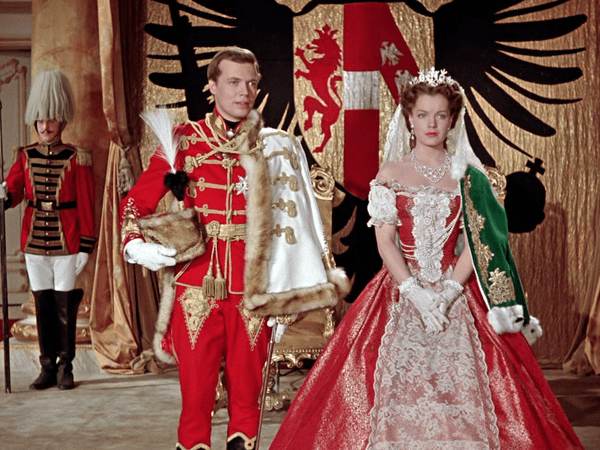 Have not seen the films but there is an old British TV series about the royal houses of Europe, Fall of Eagles, which features Sissi in several of the early episodes. She was portrayed as being a strong minded woman, though possibly of fragile mental and physical health who took an interest in international affairs, stood up to her domineering Mother in Law, and when the marriage went sour, basically chose how she would live her life so an interesting woman. . 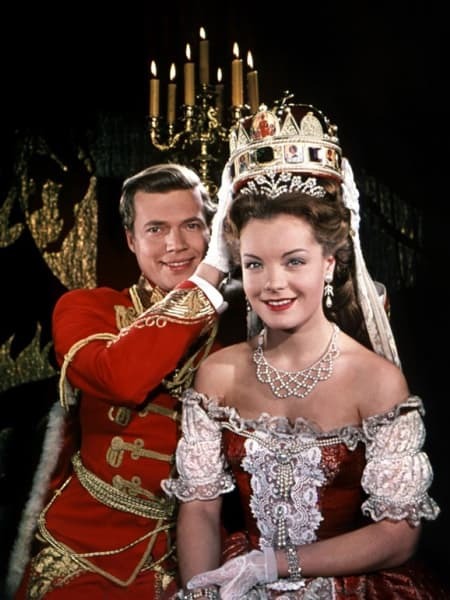 Yes, I loved the film with Romy Schneider as Queen Victoria – I think it’s called “Victoria in Dover” in English – as a child :) But my favourite was actually “Magnificent Sinner” in which Romy plays Catherine Dolgorukov, mistress and later wife of Tsar Alexander II. None of them is historical accurate nor are the costumes that great but I still have a soft spot for them. They are still a big thing in Germany and are being shown around the holidays alright. I’m so happy you reviewed them! There’s a drinking game, too, called “Sissisaufen” (Sissi drinking). The rules (okay, one set of rules, there are variations) state that each time Sissi or Franz say each other’s name you take a sip, and each time someone says “Your Majesty” (or just “majesty”) everyone raises, shout “Long live the Empress!” and take a shot. And I’m with my forecommenters, I absolutely recommend the Musical! She had the most awful death, Empress Sissi. I won’t divulge it here, but google it if you must. They are shown in Austria every Christmas. Back in the 80s they’d also show them in May around Independence Day. Austria gained its independence in 1955, and the movies were part of a “let’s all feel good about ourselves in our new country” movement. I would like to note, for the record, that as fancy, frilly and pretty as the “Sissi” costumes are (I have the boxset from Fox Lorber Video containing all three of the uncut Sissi films plus the one where Romy plays the young Victoria), I must explode into a rant here, because the opera gloves are hideously inaccurate. HIDEOUSLY. Now, over-the-elbow gloves are my favorite accessory ever, and one reason I love Belle Epoque costume so much, but they were almost never worn between the 1820’s and early 1870’s (when, according to at least one writer, they were brought back into fashion by no less a luminary than Sarah Bernhardt, who wore them to disguise her arms, which she considered to be unattractively thin – the same reason, in fact, that Vivien Leigh also often wore gloves, I am given to understand). In fact, women’s gloves rarely even came anywhere close to elbow length, even with short-sleeved ball dresses, during that period. The wrist-length glove ruled supreme. Sissi movies are my favourites movies of all time. I think no others movie have this perfection of characters, actors, storytelling, costumes . I love all them. 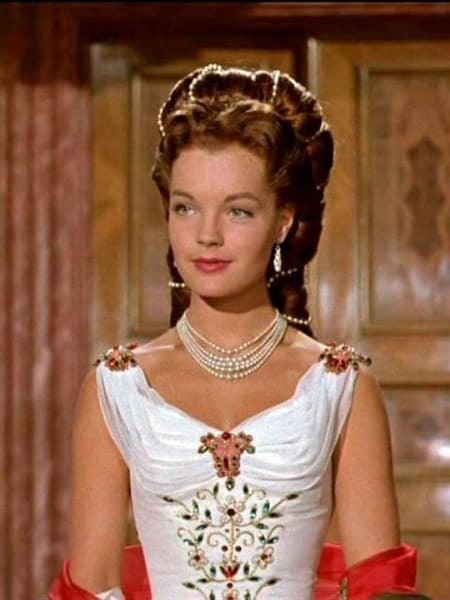 Romy Schneider is the most beautiful woman ever seen alongside Grace Kelly. She is sweet, charming, very classy . The setting is too good. I know movies tell Sissi’s story as a fairy tale but I think people at the cinema must to dream , Sissi’s movie create dreams. My favourites. I love them!